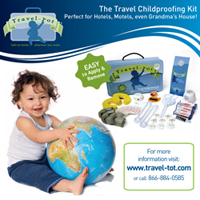 Travel-Tot: Baby, It's Cold Outside! Winter is on its way, and that means more time hunkering down indoors and trying to stay warm. But snuggling up with a warm mug of hot chocolate isn’t always going to be enough! According to the CDC, young children and the elderly are disproportionately affected by hypothermia and carbon monoxide poisoning during the winter months. Often this results from failure to prepare for weather-related emergencies or improper maintenance of heating systems. The checklist below contains a few crucial steps that you can take now to help prepare your family for whatever this winter may bring. and vented to the outside. o Inspect and clean fireplaces and chimneys. o Install smoke detectors and test batteries monthly. o Have a safe back-up heating source and fuel. leaves/snow from walkways/driveways and low lying vents). - rock salt, cat litter, or sand for icy walkways. You'll all enjoy snuggling up together indoors a little more if you know you've done everything you can to plan ahead for the safety and comfort of your family, should an emergency arise!